A man, 42, identified as Tambaya Manu, was on Tuesday killed by a mob after allegedly killing his mother in-law in Kebbi State. The incident reportedly occurred at Bangu village in Mahuta town of Fakai Local Government Area of Kebbi State. A witness, who pleaded anonymity, said Manu had allegedly committed the offence after his in-laws refused him access to his wife, Aisha, who was domiciled with her parents after he had divorced her. “The couple had a disagreement which led to divorce a month ago. Following the divorce, the wife had to relocate to her parent’s house. “Several efforts to resolve the crisis and reunite the once-happy couple yielded fruitless results. “Tambaya decided to storm his in-law’s house to retrieve his wife but her family members refused. 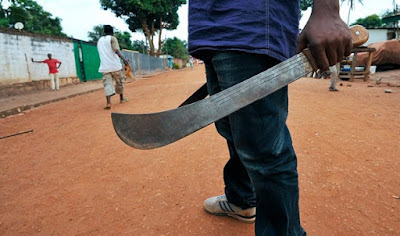 This prompted him to brandish his machete and he slaughtered his mother in-law,’’ the source said. The source further said the mother in-law died instantly, adding that “he also attacked two other members of the family but they were rescued by their neighbours. “After committing the offence, he attempted to flee the scene but a crowd that had gathered overpowered him and mobbed him’’. Confirming the incident, the Police Public Relations Officer, DSP Mustapha Suleiman, said his men found the village deserted when they got there. “Two people died in the incident – mother in-law and son in-law,’’ Suleiman said.